These are something I make quite often. 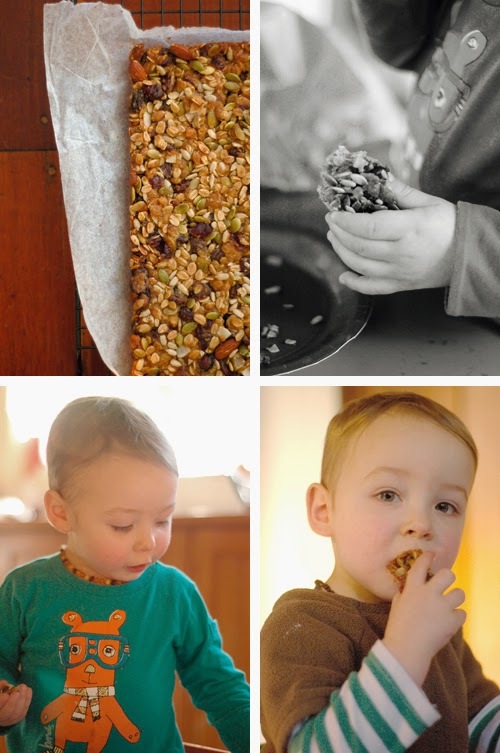 I found the original recipe here when I was just starting out Baby Led Weaning and solids with the boys. They are nice little afternoon tea snacks and yes, there is a bit of sugar in them, it’s not ALL bad. Besides, I think Jacob and I eat most of them! The last batch of these I made, I had some handsome help in the kitchen! Here is our latest version of them! The Always Keen to Help Hendrik. Preheat your oven to 180C and line a baking tray, 20x25cm, with parchment paper. Place all of the dry ingredients into a big bowl and mix to combine. The key is to have 3 cups of a mix of oats, fruit, nuts etc. We use our favourite muesli from Moore Wilson’s that has oats, almonds, papaya, raisins, and such. Then we add in anything else we like. Melt the coconut oil and golden syrup, it doesn’t combine as well as butter, but still does the trick in the long run. Pour the syrup mixture into the dry bits bowl and stir to combine. Pour it all into the baking tray and pop in the oven. Bake for about 20 minutes. Take it out of the oven and let it cool completely before cutting. This is the hardest part, especially if Jacob’s around to sneak a few nibbles off. We leave it in a airtight container in the pantry, I wouldn’t know HOW long it would last, as it’s usually gone in a couple of days. H & W proud of their efforts. Place all of the dry ingredients into a big bowl and mix to combine. Melt the coconut oil and golden syrup in a saucepan. Pour the syrup mixture into the dry bits bowl and stir to combine. Pour it all into the baking tray and press it down and into the corners of the tray and pop in the oven. Take it out of the oven and let it cool completely before cutting. Previous Post Spring…… Where are you! ?